Jonathan Cheban has been single ever since he split from Anat Popovsky in 2016. 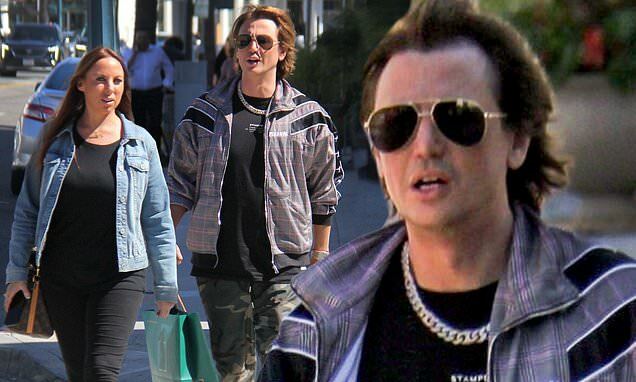 But on Tuesday the 45-year-old TV star was seen with a mystery woman as they strolled in Beverly Hills after a shopping trip. This comes just as he finished shooting season 16 of Keeping Up With The Kardashians with Khloe and Kim Kardashian. The lady was in all black as she wore a blue denim jacket and white sneakers with a Louis Vuitton purse on her shoulder. Jonathan was in a grey and black jacket over a black top and camo slacks. He had on Yeezy sneakers gifted to him by Kim's rapper husband Kanye West. The day before the Celebrity Big Brother star was seen in the same city. He spent some quality time with his bodyguard. The two grabbed Italian food at Il Pastaio - where Scott Disick and Kendall Jenner often dine - in Beverly Hills. The Spin Crowd vet wore a grey 11.11 top with jeans and on trend sneakers. The star also wore sunglasses and his blingy jewelry.